With popularization of the concept of the Internet of things (IoT), more and more people want to know and make their own IoT device. The common WiFi cannot satisfy the mobile application scenarios, while the emerging NB-IoT network has a limited coverage area, so the most popular 2G network becomes one of the best choices at present. 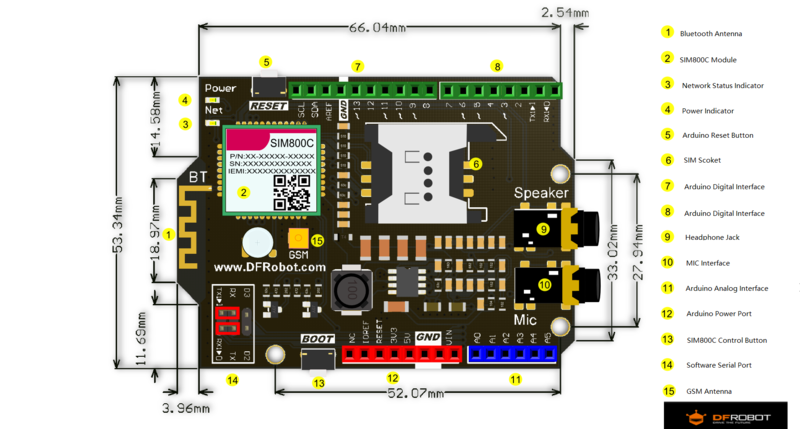 DFRobot has updated the former GSM/GPRS expansion board, using the same series SIM800C GSM/GPRS chip as Mobike, in order to provide stable and reliable IoT links. A user may send AT instruction through UART communication interface, so as to make a call, send a short message and realize GPRS remote data acquisition, etc. 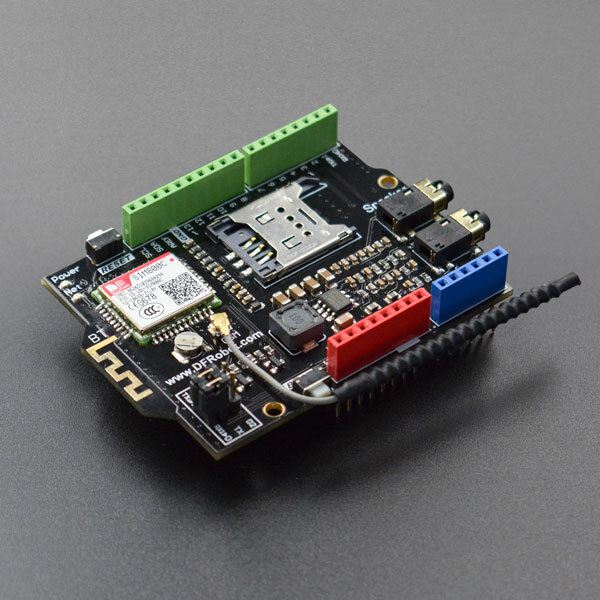 SIM800C GPRS/GSM expansion board is encapsulated by Arduino standard, and can be externally connected with Arduino UNO, Leonardo and other controllers. The expansion board is externally expanded with TX&RX interface by jumper. Communication can be connected by soft serial port for convenient development. The built-in Bluetooth 3.0 wireless communication function may cooperate with mobile phone to realize point-to-point communication, and see SIM800C User Manual for more advanced features. Caution: Since GSM is impulse type transmitting power, and the average current is very low, but the instantaneous current can reach more than 1.5A, so the external power supply is used in the use of GSM expansion board. USB port can only provide 5V@500mA, which cannot meet output of instantaneous power supply. Note: In addition to the Boot button, the pin D12 can also be pulled high for 2s to realize module startup & shutdown. Through the following tutorials, the companions can use the functions of software startup & shutdown, making and receiving a phone call, receiving/sending short messages, Bluetooth, etc. of this communication module. The companions are made to enter into the communication palace of sim800 series module easily. Caution: Please use 7.5~23V external power supply. Press boot for 2s or download the following program to start up the module. 64ms on/3,000ms off——the module registers the network. Caution: The module is made to start up or shut down every time the serial port is opened or the reset is pressed; if NET lamp is found not to respond (shutdown), press Reset again to start up the module. * This example show you how to use SIM800C GPRS/GSM  Shield V1.0 to make a call. *This code is tested on SIM800C GPRS/GSM Shield V1.0. This program is combined with the above software startup program, and the module is controlled by sending AT instruction with arduino serial port to realize the function of making a call; “123456789” in the code. Here, you may modify any phone number that you want to dial (only if it is valid). It is necessary to pull up the “jumper” on the module during the burning program, because the burning code will occupy the serial port. The jumper is connected to D2&D3 side, and the soft serial port is used for Bluetooth communication this time. * This example show you how to use SIM800C GPRS/GSM  Shield V2.0 BT-SPP. * This code is tested on SIM800C GPRS/GSM Shield V2.0. This routine uses the soft serial port of arduino, and No. 2 and No. 3 digital pins are used as RX\TX of the serial port. After the program is burnt, “spp” Bluetooth serial port of the mobile terminal can realize wireless communication with serial assistant of the computer terminal through Bluetooth of the module. Note: Those in the quotation mark are UCS2-BIG codes of phone numbers. Send a short message, after returning the character “>”, input the short message to be sent, with the content code of UCS2 code (set above), then check HEX sending, send “1a”, and end with CTRL+Z(0x1A). Get SIM800C GSM/GPRS Shield V2.0 SKU:TEL0089 from DFRobot Store or DFRobot Distributor.